You may have read the article in the Burtonwood Times Volume 15 No. 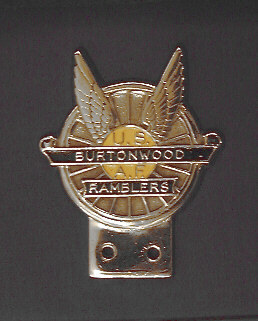 2 about The Burtonwood Ramblers - Burtonwood's official motorcycle club. A badge was produced for members to display on their machines. It was designed by Bob Johnston in the early 1950's and made at Burtonwood. One badge is on display at the Heritage Centre, kindly donated by Bob. Are there any more examples out there? Only a few were produced. If you have one let me know.